We’d love your help. 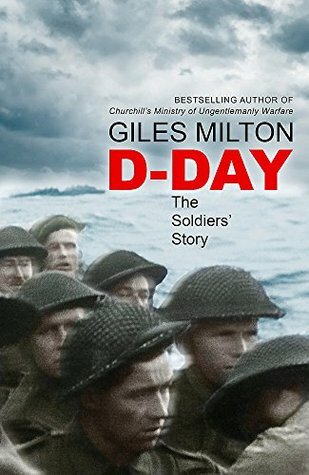 Let us know what’s wrong with this preview of D-Day by Giles Milton. Almost seventy-five years have passed since D-Day, the day of the greatest seaborne invasion in history. The outcome of the Second World War hung in the balance on that chill June morning. If Allied forces succeeded in gaining a foothold in northern France, the road to victory would be open. But if the Allies could be driven back into the sea, the invasion would be stalled Almost seventy-five years have passed since D-Day, the day of the greatest seaborne invasion in history. The outcome of the Second World War hung in the balance on that chill June morning. If Allied forces succeeded in gaining a foothold in northern France, the road to victory would be open. But if the Allies could be driven back into the sea, the invasion would be stalled for years, perhaps forever. An epic battle that involved 156,000 men, 7,000 ships and 20,000 armoured vehicles, the desperate struggle that unfolded on 6 June 1944 was, above all, a story of individual heroics - of men who were driven to keep fighting until the German defences were smashed and the precarious beachheads secured. Their authentic human story - Allied, German, French - has never fully been told. Giles Milton's bold new history narrates the day's events through the tales of survivors from all sides: the teenage Allied conscript, the crack German defender, the French resistance fighter. From the military architects at Supreme Headquarters to the young schoolboy in the Wehrmacht's bunkers, D-Day: The Soldiers' Story lays bare the absolute terror of those trapped in the frontline of Operation Overlord. It also gives voice to those hitherto unheard - the French butcher's daughter, the Panzer Commander's wife, the chauffeur to the General Staff. This vast canvas of human bravado reveals 'the longest day' as never before - less as a masterpiece of strategic planning than a day on which thousands of scared young men found themselves staring death in the face. It is drawn in its entirety from the raw, unvarnished experiences of those who were there. To ask other readers questions about D-Day, please sign up. Personal accounts from varied participants illuminate movingly the brave heroics, the terrible tragedies and the impressively huge scale of the operation....and how in this modern era, we have nothing to complain about. I loved this book brings a fresh perspective to D-Day. British writer and journalist Giles Milton was born in Buckinghamshire in 1966. He has contributed articles for most of the British national newspapers as well as many foreign publications, and specializes in the history of travel and exploration. In the course of his researches, he has traveled extensively in Europe, the Middle East, Japan and the Far East, and the Americas. Knowledgeable, insati British writer and journalist Giles Milton was born in Buckinghamshire in 1966. He has contributed articles for most of the British national newspapers as well as many foreign publications, and specializes in the history of travel and exploration. In the course of his researches, he has traveled extensively in Europe, the Middle East, Japan and the Far East, and the Americas. Knowledgeable, insatiably curious and entertaining, Milton locates history's most fascinating—and most overlooked—stories and brings them to life in his books. He lives in London, where he is a member of the Hakluyt Society, which is dedicated to reprinting the works of explorers and adventurers in scholarly editions, some of which he uses in his research. He wrote most of Samurai William in the London Library, where he loves the "huge reading room, large Victorian desks and creaking armchairs". At home and while traveling, he is ever on the lookout for new untold stories. Apparently he began researching the life of Sir John Mandeville for his book The Riddle and the Knight after Mandeville’s book Travels "literally fell off the shelf of a Paris bookstore" in which he was browsing.